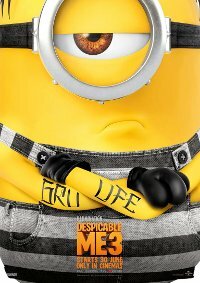 The third in the Despicable series (4th if you count Minions) continues the adventures of Gru, Lucy, their adorable daughters (Margo, Edith and Agnes) and the Minions. In this episode they have to deal with the villain Balthazar Bratt, a former child star who’s grown up to become obsessed with the character he [layed in the ’80s, and proves to be Gru’s most formidable nemesis to date. This film is releasing in 2D and 3D. This is the 3D version.